Build dynamic user interfaces using navigation rules that support multiple actions, keyboard events, and data transforms that accept parameters. 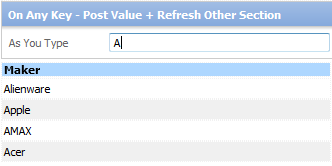 Set the value of a field on the client, set a value within a row, or use click actions to set focus. 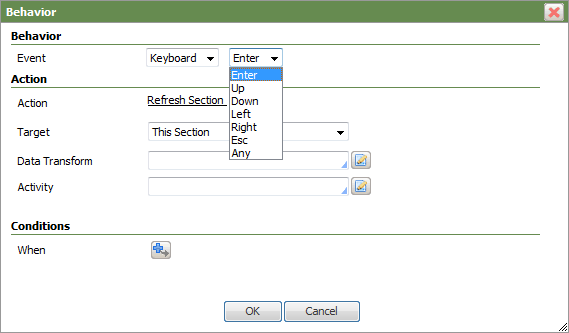 Keyboard events enable your users to take actions using certain key combinations. For example, you can filter a Grid based on a search term (pxTextInput) and click Enter to return the results, or filter a Grid as you type by passing a parameter to a Report Definition. Keyboard events are available in typeable Controls (Text Input, Date/Time, and Lookup) with a set of appropriate actions. To view this configuration, access the UI Gallery, > User Interface > UI Gallery, and select Search and Select in the Combinations group. 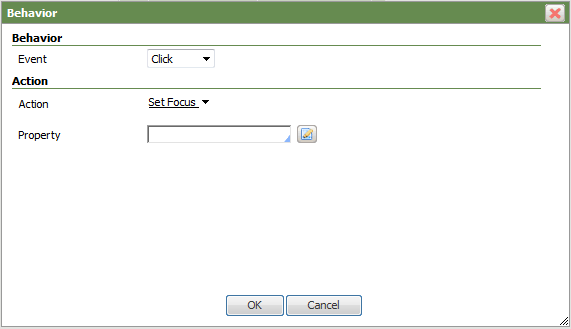 Use this click action to determine where the cursor is positioned after an action completes. For example, if a section or layout becomes visible on click of a button, you can set the focus to an editable Control in the now visible section. Set Value and Set Focus can help guide users through a screen interaction. In the following sample, they are used to facilitate building a list by selecting from available names. 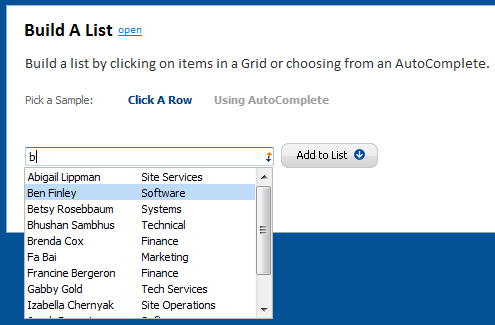 After using the AutoComplete to select a name, the “Add to List” button updates and refreshes the list, uses Set Value to clear the previous value from the field, and uses a Set Focus to move the cursor back into the AutoComplete. Everything is ready for the user to select another name and repeat the process. Set Value has been extended to work with Grids. 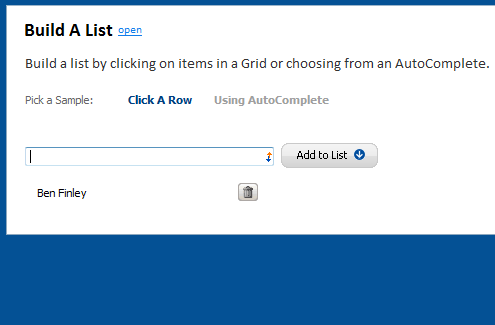 You can set a value within a row or configure a Click action that puts a row value into a field outside of the Grid. To interact with this sample, access the UI Gallery, > User Interface > UI Gallery, and select Build A List in the Combinations group. This keyboard action posts the property value to the clipboard and refreshes the cell's contents. This keeps a field in synch with the clipboard, meaning that the data is already present whenever, however, and from wherever you initiate the refresh. To view this configuration, access the UI Gallery, > User Interface > UI Gallery, and select Post Valuein the Dynamic UI group. Navigation rules now support multiple actions and event queuing, similar to that of Controls, Menus, and Grids. 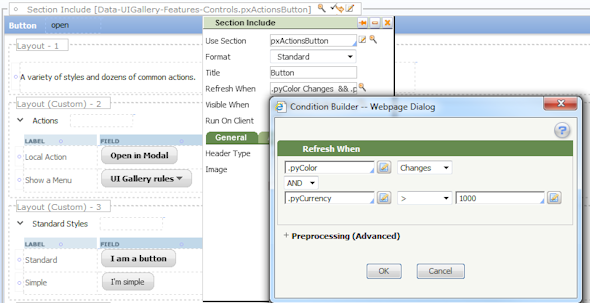 For example, you can configure a click action to initiate a local flow action and then refresh a section. Actions are executed sequentially as displayed in the list. If an event triggers other behaviors, those actions are allowed to finish before the next event starts. The Condition Builder supports more complex Refresh When and Visible When conditions. It supports the full property reference syntax and enables you to mix-and-match different types of comparisons. You can now reference the value of embedded properties anywhere within the current work object (pyWorkPage clipboard page) or assignment. Create powerful Data Transform rules that take the user’s context into account by passing in parameters. This option is available whenever you specify a Data Transform, including from Flow Action rules and the Refresh Section action.